Like many of her friends, Regan Charon took up snowboarding when she came to Burlington to attend Champlain College. Although the Bennington native had grown up skiing at Stratton Mountain, she stuck with riding for the next 10 years. At 29, Charon had a son and took a break from snow sports to care for him. Then, two years ago, when Hayden was four, Charon decided it was time to go back to the mountain. But when mother and son hit the slopes together, it was not on snowboards, but with skis and poles. Charon’s decision may illustrate a trend that concerns those in the snowboarding industry. By most accounts, the rush to go downhill fast on a single board — instead of two — appears to be slowing. As skiing’s younger, edgier cousin has matured, industry and market reports have shown small but steady drops in the sport’s participation and revenues. According to an annual survey by the National Ski Area Association, snowboarding hit its peak popularity in the 2009-2010 season, when riders accounted for 32 percent of the country’s total resort visits. Since then, that number has shrunk at least 0.6 percentage points each year, ending at 29.5 percent in the 2012-2013 season. The drop has been less dramatic in the Northeast, where snowboarding was slower to catch on. Of 13.4 million snow sport visits in this region, participation slid from 27 to 26 percent over the same three-year period, according to the combined data for New York and New England ski areas. Still, while snowboarding has declined across the country, people are more committed to the sport in Vermont than in other states. The NSAA doesn’t separate out data for the Green Mountain State, where two of snowboarding’s biggest brands — Burton and Rome — are based. But a 2013 market report from the trade association Snowsports Industries America does. Last year, 7.1 percent of Vermonters snowboarded, compared with 6.1 percent in Colorado, 5.4 in Washington and 4.7 in Connecticut. 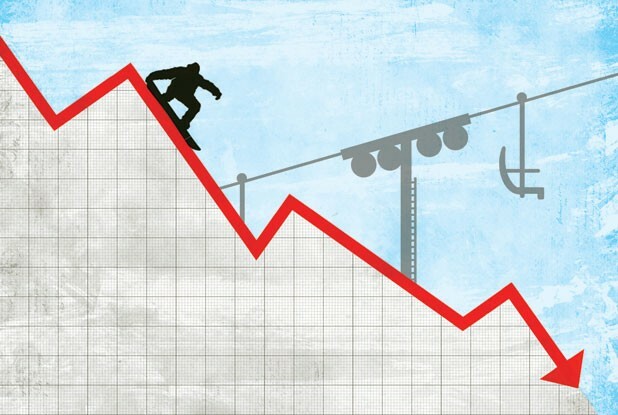 The recession and two balmy winters are partially to blame for the drop in business, says SIA director of research Kelly Davis, which equates to a $15 million reduction in snowboarding equipment sales in the Northeast over the past three years. The 2011-12 ski season was a loser for everyone. According to the National Weather Service, Vermont received 37.7 inches of snow — the third smallest snowfall in more than 100 years. As a result of that year’s premature mud season, Davis explains, ski and snowboard retailers began marking down items and ordering less, a trend that continued last winter despite colder temps and more snow. But it was during the 2010-11 season — the state’s third whitest in history — that snowboarding began losing ground to skiing. Matt Weingast has his own theories about the decline. A New Jersey native who worked in a ski shop during high school, the UVM grad and backcountry snowboarder is now in his second year as a sales associate at Burlington’s Skirack. Meanwhile, he sees longtime riders becoming more frugal as they age, creating a vicious cycle as customers wait for marked-down gear from previous seasons. “That older guy is going to be a little more price conscious,” Weingast speculates. Even if that guy is getting a new board, Weingast adds, he may not replace his older boots or bindings, which tend to last longer than their skiing equivalents. There may be some truth to Weingast’s point about technology and its relationship to the bottom line, explains Davis. “Innovation does tend to drive the consumer to buy,” she says, and “Skiing technology is on a different cycle.” Davis points to recent evolutions in the traditional Alpine ski setup that have allowed for more customization, including lighter skis and bindings that detach at the heel for hiking. Investing in such upgrades may renew an athlete’s commitment to the sport. Meanwhile, snowboarding tech has remained comparably static, Davis says. The rockered board emerged several years ago and now accounts for more than half the rides on the market, while the splitboard, which divides into two planks to allow hiking, has yet to make a significant dent in the market — possibly because putting it to use takes significant effort. If Boliba is right, it’s thanks in no small part to his own discovery that by pulling little snowboarders around on a rope, instructors can introduce them to the sport without the normal first-day frustrations. Boliba called the resulting towrope the Riglet Reel, and he began working with resorts to build graded training grounds called Riglet Parks. By making the sport safer through such “terrain-based learning,” Boliba says, he’s trying to prove that kids can be native riders. “There’s still an assumption out there that kids have to ski first. That used to be the case,” Boliba says. With the Riglet Parks, “we’re trying to build this awareness that with the right product and right environment, they can snowboard first,” Boliba says. So far, Burton has helped build around 40 permanent Riglet Parks across the world, including four in Vermont. Several have popped up at Burton’s flagship store in Burlington, and Boliba says he’s working with several school districts around the state to incorporate temporary, indoor Riglet courses into the physical education curriculum. Last year, the Allenbrook School in Williston hosted one. “If you slam down on boards or skis, your day can be done,” Boliba says of the potential for kids to crash even on the bunny slopes. Also important, he says, is keeping snowboard classes small; some resorts load them up with 20 students. Will young, snowboarding parents who used to ski — like Charon — stick to boarding or return to their native sport? Will kids who learn on skis take on the snowboarding challenge? These questions are what’s driving the industry’s “focus on youth products,” Sullivan says. Both Rome and Burton have designed softer boots and more pliable boards for the 3-to-5-year-old set. Smugglers’ Notch has a Riglet Park, and the resort has incorporated other terrain into its snowboard curriculum in the last couple of years, according to the mountain’s snow sports school director, Harley Johnson. “We teach them how to stay in control, we teach them how to fall safely,” she says, noting that instructors are seeing fewer wrist injuries as a result. Johnson says Smuggs hasn’t experienced a decline in demand for snowboarding lessons over the last three years. What has changed is the type of lessons people are taking: All-day lessons have dropped, Johnson says, while two-hour sessions are more popular. Night lessons have also been growing, a trend that Johnson attributes to skiers who just want to dabble in snowboarding. For the sport to grow, explains NSAA president Berry, the snowboarding industry should continue to focus on easing beginners into it. The biggest numbers won’t come from converts, he says, but from parents putting their child on a board.